A year after sitting out an MLS Cup playoff tournament won by his team, Seattle forward Clint Dempsey has been named Comeback Player of the Year. 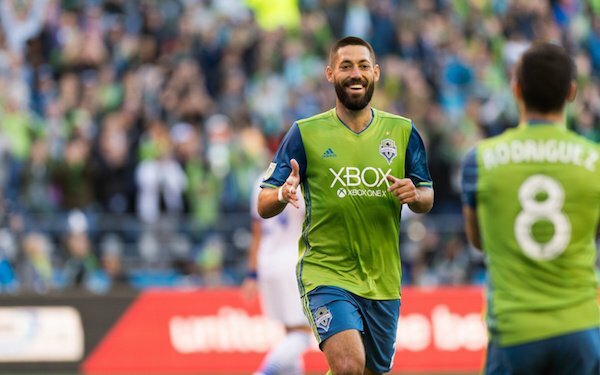 Dempsey edged out Columbus midfielder Federico Higuain and Houston striker Erick ‘Cubo’ Torres in voting conducted among players, club coaches and executives, and media members. The media vote carried the day for Dempsey, who trailed Higuain in the player vote and club vote. Players who have overcome injuries or significant adversity to play at a high level are eligible, and Dempsey certainly qualifies. Detection of an irregular heartbeat in August of last year prompted the Sounders to shut him down while they rolled down the stretch under interim head coach Brian Schmetzer to win the club’s first MLS Cup. Dempsey missed 10 regular-season games and all six playoff matches last year; he returned to competition early in 2017 for the USA and Seattle, which he led during the regular season with 12 goals in 29 games. Dempsey, 34, is within one goal of the club’s all-time record of 47 and is tied with Landon Donovan as the all-time U.S. leader with 57. By scoring 57 Premier League goals for Fulham and Tottenham from 2007 to 2013, he holds the record for goals by an American in a top-tier foreign competition. On Nov. 5, Dempsey scored both goals in Seattle’s 2-0 defeat of Vancouver in the Western Conference semifinals. His contract expires at the end of the 2017 season but the club has stated its intention to re-sign him. The MLS Rookie of the Year in 2004, Dempsey is a four-time MLS All-Star and has been named U.S. Soccer Athlete of the Year three times.